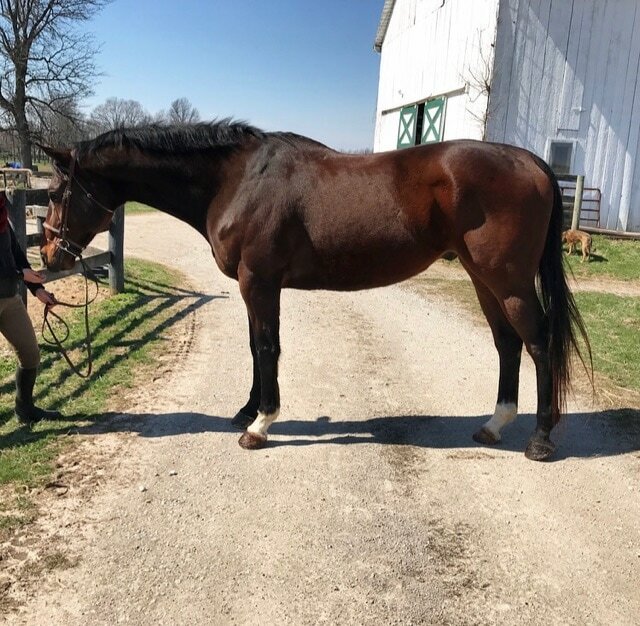 Squad is a 10 year old TB gelding, 17hh and big boned. Squad is currently jumping around 2'6" courses with a natural lead change and is brave, willing, and quiet. 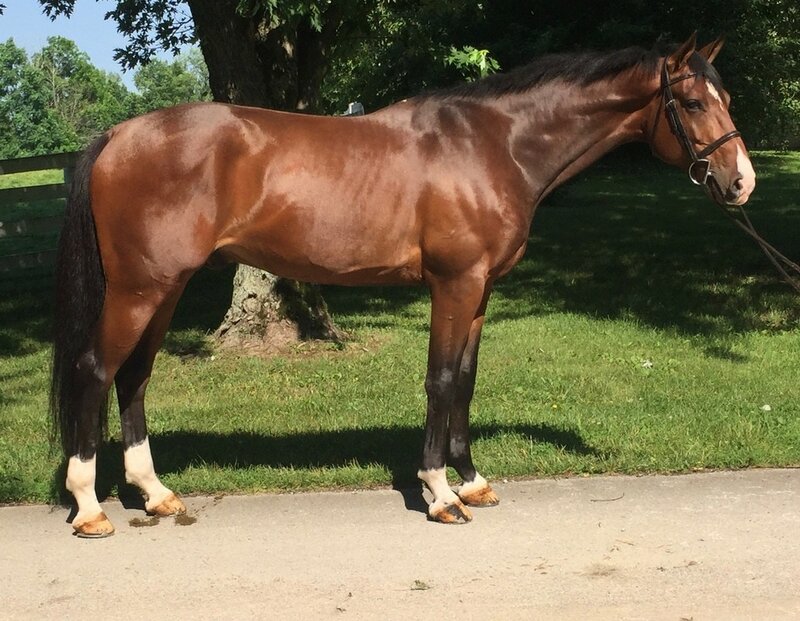 He has been in hunter/jumper training since late 2016, and is wonderful to have in the barn. Easy keeper, easy to turnout, no vices or health issues. Squad has been trail riding and rides in the fields like a pro. Easy to trailer and is great off the farm. Great buy! "Felix" is a recently imported 5 year old gelding, standing 16.2hh. He is a wonderful Children's or Junior Hunter prospect. Pretty mover, cute jumper, and easy lead changes. He was Reserve Champion in the Baby Greens at his first "AA" show with several class wins. SO easy to get to the ring and always marches around the first time. Felix is jumping around 3' courses and has a big step and is always brave and quiet to the jumps. He will move up soon to the 3' and is ready for a junior or amateur rider! 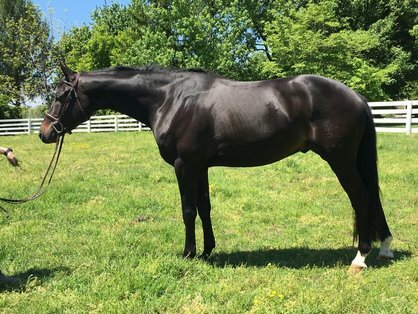 Luigi is a 6 year old imported Dutch Sport Horse, imported in 2016, 16.1hh. 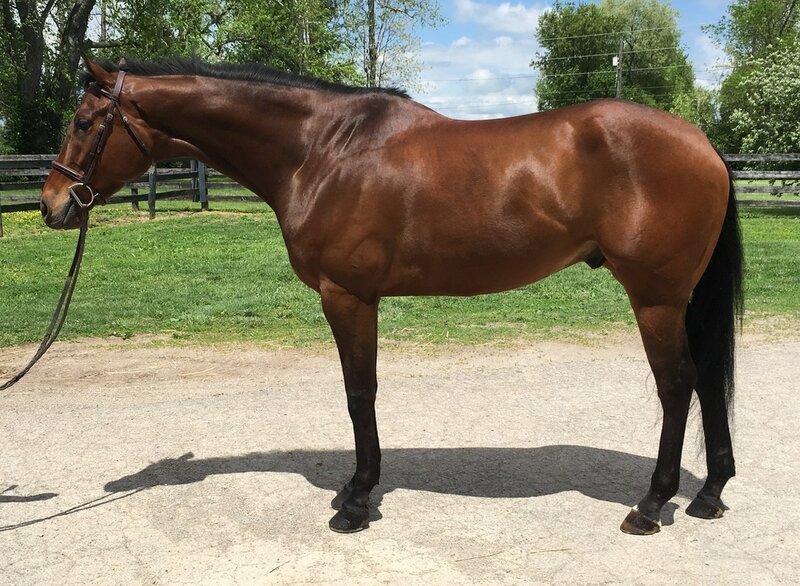 He is a wonderful gelding with a sweet personality and a ton of potential. Luigi did a few shows in the Baby Greens, with top ribbons in great company, and has now stepped up to the 3' Green division. He has an easy lead change and is brave and consistent to the jumps. He shows no problem with the height and will eventually be a 3'6" horse. Simple enough already for an amateur or junior rider. "Geoffrey" is a 5 year old AQHA gelding, standing 17.1hh. He is by the World and Congress Champion "The Only Escape" and out of Congress Producing mare Victoria's Secret. Geoffrey is a nice mover with a big, ground-covering stride and very smooth gaits. He is currently jumping around 2'6" courses with a perfect lead change. He is easy to work with on the ground- loads, clips, bathes, etc. 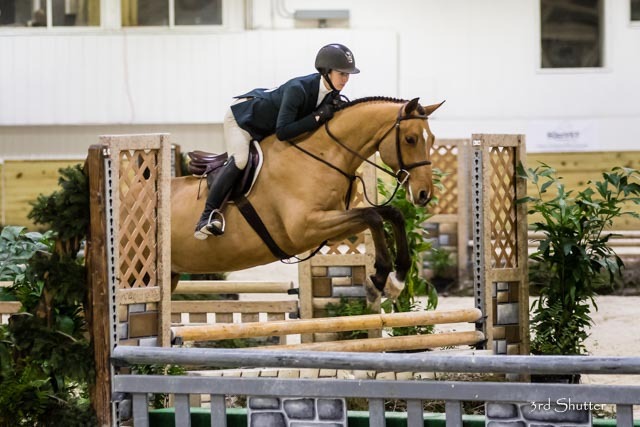 Geoffrey could be competitive in both the AQHA and USEF circuits. He is brave to the jumps and very naturally quiet around the course. Easily will be a 3' horse with scope to potentially go bigger! 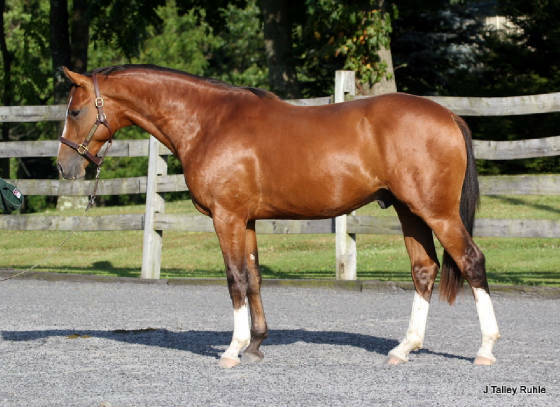 "PR" is a 5 year old Hanoverian gelding by Pablo. He is a wonderful hunter prospect that will eventually end up in the Small Junior ring. He was started under saddle in January 2017 and is WTC and has even started over small jumps. Super quiet (spur ride) and easy, even as green as he is. No spook at all. Sweet personality and easy in the barn. 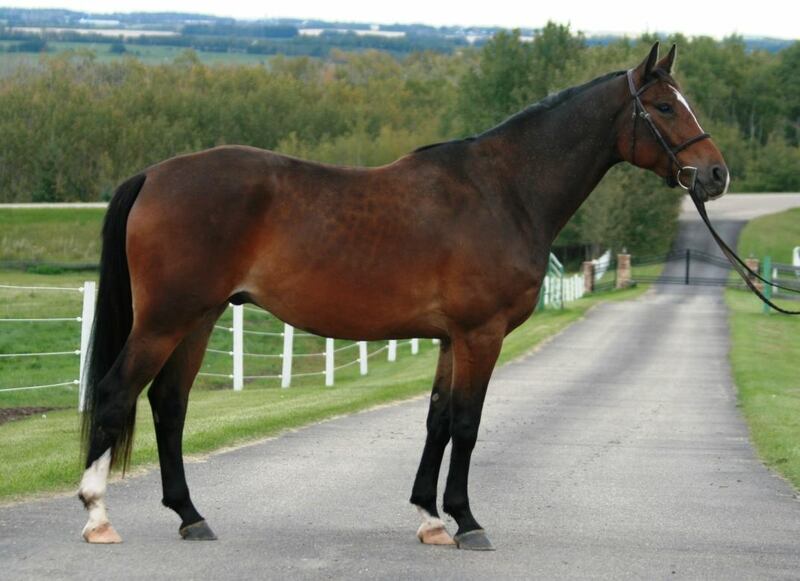 "Finn" is a 2012 Canadian WB gelding, 16.1hh. Finn is a wonderful young horse with the BEST brain. He is jumping small courses and is ridden mostly by his amateur owner. He recently went to his first "A" show and competed in the Beginner Horse at 2' and Intermediate Adult hunters at 2'6" and was a superstar, even winning the under saddle. He has zero spook and a great, laid-back attitude in a new place. No prep at all, went from the stall to the ring! 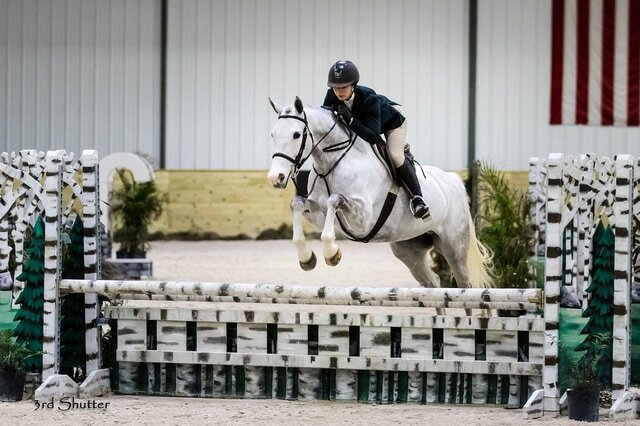 He has a cute jump and a natural lead change and will definitely make up into a lovely Junior Hunter! Faith is an 8 year old WB mare, 15.3 7/8 (permanent card). Owner is off to college and must sell! Faith has lots of show miles at 3'3" and 3'6" and can do the hunters and equitation. Always gets a ribbon under saddle. Well broke on the flat with all the buttons- lead changes, counter canter, extension, etc, and is super comfortable and fun to ride. This mare is ready to teach another rider the ropes. Very honest and forgiving in the ring, doesn't need much prep. Max, a 5 year old Westphalian gelding standing at 16.2hh, was imported in April of 2017. He is a lovely gelding with a willing attitude and work ethic. With a wonderful, comfortable canter and big, slow step, Max will make up to be a very successful equitation horse or hunter. Max is jumping around 3 foot courses at home and will soon begin his horse showing career. Maggie is a 9 year old Dutch Sport Horse, imported January 2017, standing right at 16hh. She has made her transition to the hunter ring successfully, including several Champion and Reserve awards. Maggie has a huge, slow stride, good lead change, and is as forgiving as they come. She has ZERO spook, and is a total pro at the horse shows. Will be an awesome Small Junior! "Z" is a 7 year old imported mare by Zacharov, standing just under 16hh. 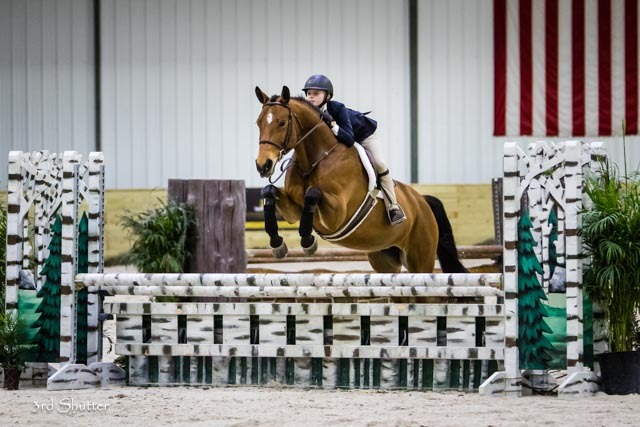 Z was imported in 2015 and has spent her time in the US teaching a young rider the ropes in the jumper ring (with lots of success!) and has just recently made her debut in the hunter ring. She is currently showing 3'3" Greens and is ready to move up! Most recently Reserve Champion at WEC Summer I ("AA"). She has a great jump, is a cute mover, and is brave and not spooky to the jumps. 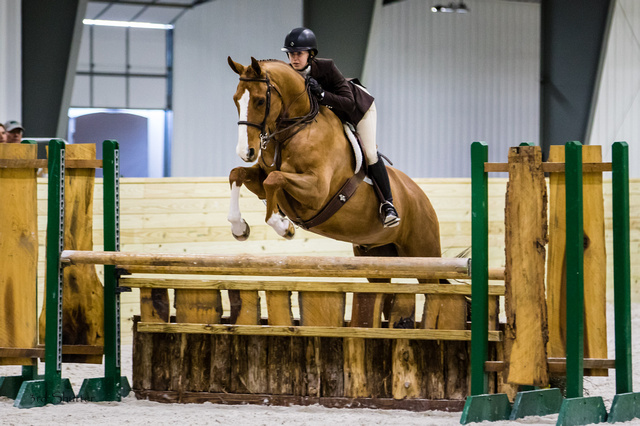 Z will be a great Small Junior Hunter and will easily double in the Derbies and Equitation. DeVito an 11 year old Hanoverian gelding, 16.2hh. is a wonderful equitation type that is also competitive in the hunter ring. 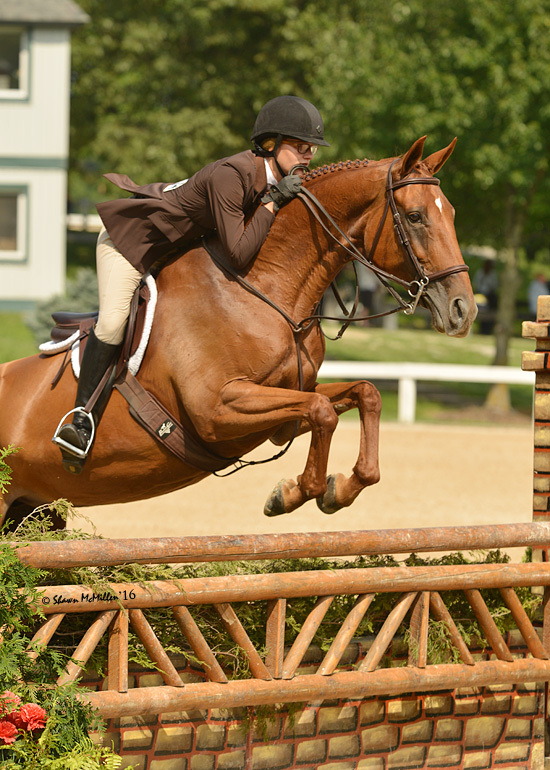 Imported in 2014, he has been leased out doing the 3'6" Medal/Maclay and now is ready for a new rider. He is very capable at 3'6" but is more suited and VERY competitive in the 3' ring. He has all the buttons, counter-canter, easy lead change, and is SUPER comfortable. Lease or sale.